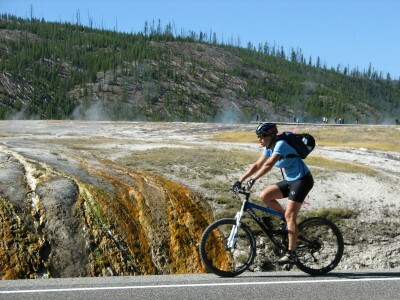 MAMMOTH HOT SPRINGS, WY – Beginning Wednesday, March 28, bicyclists willing to brave the unpredictable elements of spring can cycle select roads in Yellowstone National Park. Road segments include Mammoth Hot Springs to Willow Park and the West Entrance to Roaring Mountain. Until conditions improve, it will not be possible to bicycle between Mammoth Hot Springs and the West Entrance because the road construction area (about five miles between Willow Park and Roaring Mountain) is under construction, unpaved, deeply rutted, and muddy. There is no bicycle access to Old Faithful or Canyon until those interior park roads open to public motorized vehicle access on Friday, April 20. A spring bicycle trip into Yellowstone must be taken seriously. Quickly changing weather can be challenging. Roads may close temporarily due to weather conditions. Snow and ice may still cover sections of road. Tall snow banks may line roads and pullouts may be snow packed. Wildlife may be on the roads. Bicyclists will likely encounter and must yield to snowplows and other motorized vehicles operated by park employees or construction workers readying the park for spring opening. Bicyclists are required to ride single file and follow all other rules of the road. Bicyclists should prepare to encounter bears, bison, elk, wolves, and other wildlife at any time. It’s illegal to approach wildlife, within any distance that disturbs or displaces the animal. Riders are strongly encouraged to turn around if they encounter wildlife on the road and carry bear spray. Riders must stay out of closed areas. No services are available along these sections of road. Cell phone coverage throughout the park is sparse and unreliable for communicating emergencies. Riders should plan for self-rescue or repair, and be prepared to spend an extended period of time in winter conditions in the event they experience a mechanical breakdown, injury, or other emergency. Cyclists can call 307-344-2109 from 8:00 a.m. to 4:30 p.m. on weekdays for updated road access information.